The EL3022 analog input terminal processes signals in the range between 4 and 20 mA. The current is digitised to a resolution of 12 bits and is transmitted, electrically isolated, to the higher-level automation device. 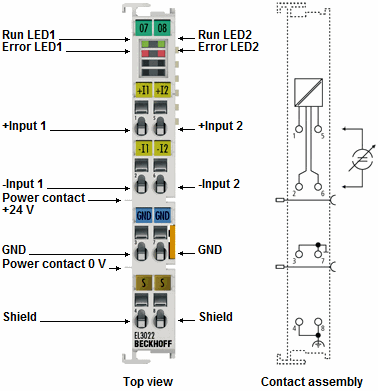 The input channels of the EtherCAT Terminal have differential inputs and possess a common, internal ground potential. The EL3022 combines two channels in one housing. An open lead or overload condition are detected. The terminal status is relayed to the controller via the E-bus. The EtherCAT Terminal indicates its signal state by means of light emitting diodes. The error LEDs indicate an overload condition and a broken wire.